SAP Center at San Jose hosts nearly 100 sporting events annually including more than 40 San Jose Sharks regular season home games. The building hosts approximately 150 events every year — including Olympic athletes, Grammy award-winners and a variety of family and children’s favorites that account for more than 170 event days. Pollstar, the leading concert industry trade magazine, nominated SAP Center at San Jose as “Arena of the Year” for 2005 and 2007. 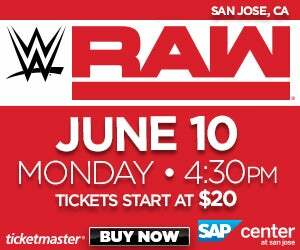 In 2007, Pollstar also recognized SAP Center at San Jose based on non-sports attendance as fourth in North America, top 10 in the world. 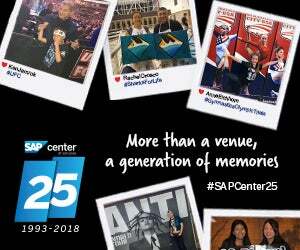 Over the past 10 years, SAP Center at San Jose has consistently been in the Top 5 in North America and Top 10 in the World. As market leader in enterprise application software, SAP (NYSE: SAP) helps companies of all sizes and industries run better. From back office to boardroom, warehouse to storefront, desktop to mobile device, SAP empowers people and organizations to work together more efficiently and use business insight more effectively to stay ahead of the competition. SAP applications and services enable more than 195,000 customers to operate profitably, adapt continuously, and grow sustainably. For more information, visit www.sap.com.